L’avenir de la Birmanie (Myanmar) est actuellement en jeu : des élections législatives se tiendront le 8 novembre prochain. Pour que ces élections soient « libres et justes », de nombreux changements constitutionnels doivent être mis en place par l’actuel gouvernement quasi civil. L’avenir du pays a amorcé un tournant inespéré à partir de 2011, et ce même si les perspectives de stabilité et de démocratie demeurent incertaines. La Birmanie vit manifestement aujourd’hui un moment crucial. Les élections législatives qui se dérouleront en novembre prochain — pour la première fois depuis le coup d’État du général Ne Win en 1962 — pourraient enfin permettre au pays d’instaurer une véritable démocratie. Suite à la vague de réformes plus ou moins concrètes déployées par le gouvernement depuis 2011, le parlement a décidé de réviser la Constitution rédigée par les militaires. Indispensable pour que les élections de 2015 soient réellement libres et justes, cette réforme devrait permettre aux Birmans de choisir leurs dirigeants et stimuler, par ailleurs, la réconciliation nationale, tout en assurant la protection des droits de l’homme, qui, sous le régime de la junte militaire précédente, étaient parmi les plus malmenés au monde. À l’heure actuelle, aucun des projets d’amendement des articles fondamentaux de la constitution n’a été approuvé. Plus que toute autre mesure, la libération des prisonniers de conscience pourrait jouer un rôle décisif dans la possible transformation de la Birmanie en un pays libre et démocratique. « In the Quest for Utopia » est un hommage aux personnes qui risquent la prison, voire qui mettent leur vie en jeu pour obtenir les libertés démocratiques auxquelles elles aspirent. Technique: cadre extra-profond, séparant la photographie du verre. Photographie d’un prisonnier politique au second plan. Verre sur lequel est reproduite l’une des pages de la Constitution de 2008 comportant les articles fondamentaux qui devraient être révisés. 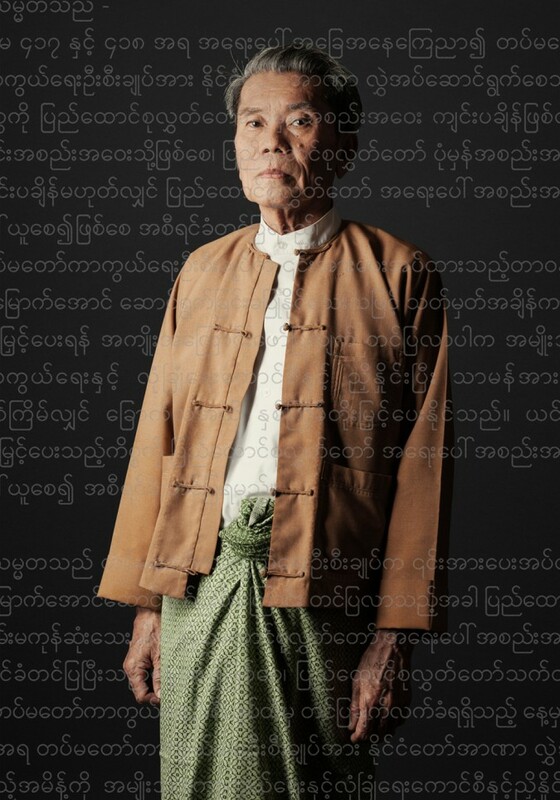 Arrested in 1970 for 2 years and 3 months for being a relative of U Nu, the first democratically elected Prime Minister of Burma. 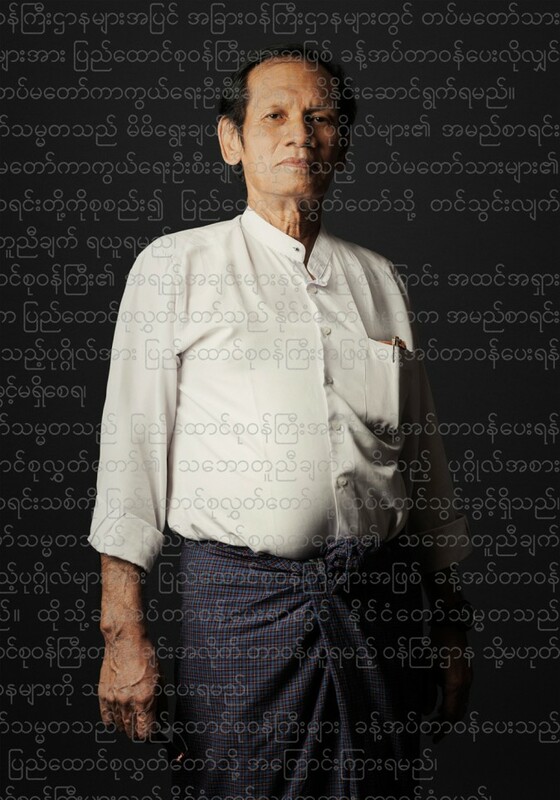 Arrested again in June 2005 for 6 years and 4 months for contacting the International Labour Organization to denounce that wages in Myanmar were very low. The ILO is a specialized agency of the United Nations (UN) dedicated to improving labour conditions and living standards throughout the world. 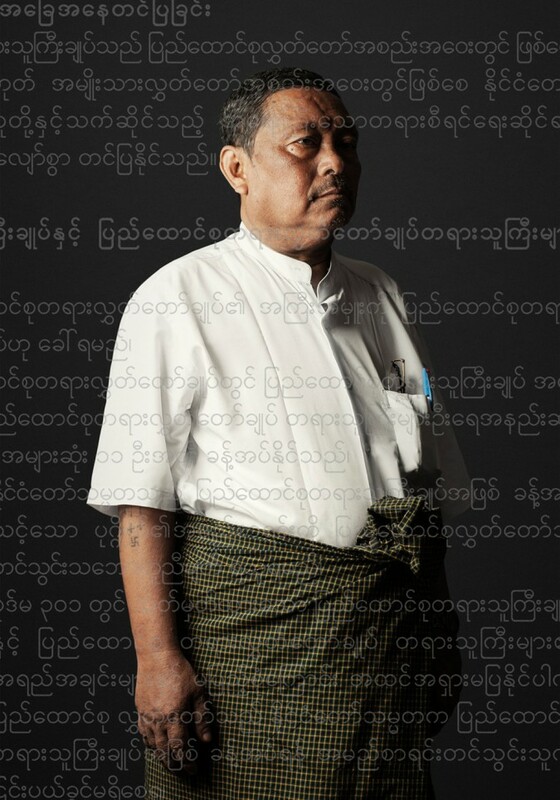 Arrested in 1990 for 8 years and 3 months as a result of his activities with the National League for Democracy led by Aung San Suu Kyi, of which he became a member after participating in the 1988 Uprising. 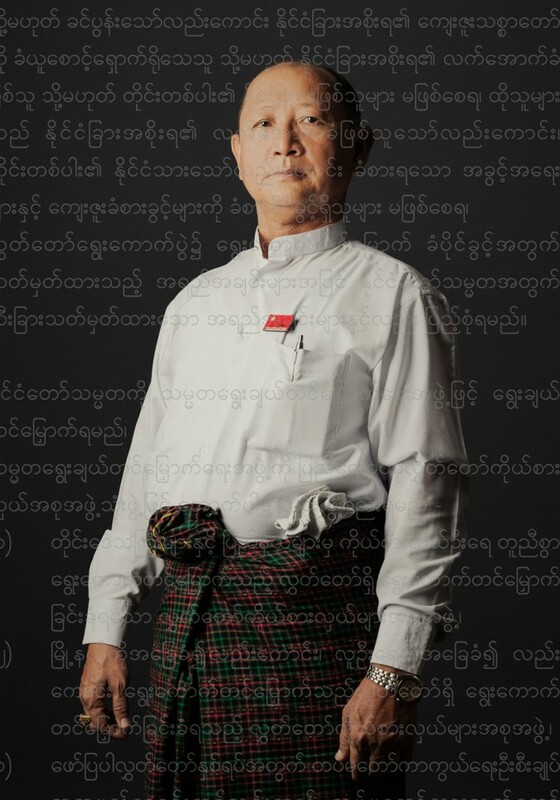 Arrested again in 2000, for 9 years, for his activities as a leading member of the NLD and for issuing the NLD member’s statement. This statement asked for the release of members who were under house arrest and for urgent tripartite dialogue between the Government, NLD and Ethnic groups. It also denounced the unlawful action of the State Peace and Development Council. Arrested in 1990 for 7 years and 7 months for helping passing the frontier to India to the ex-military that had deserted the army after the 1988 Uprising. While in prison she endured electric torture. The military applied electrodes to her ears, leaving her hearing permanently damaged. Her mother died while she was in prison. 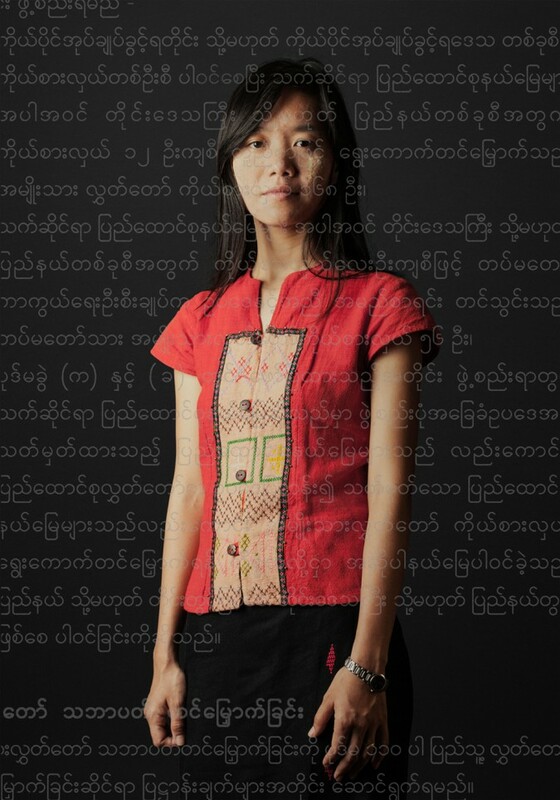 Arrested in 2008, when she was 19, for 3 years and 5 months for having participated in re-establishing the All Burma Federation of Students Unions (ABFSU) at the very beginning of the Saffron Revolution in 2007. After hiding for 9 months from the military, she left her cover and joined a volunteer group that had been formed by a friend of her father to deliver aid at the Irrawaddy Delta region after Cyclone Nargis struck. They dug a big hole in a field and they buried corpses that people were too afraid to touch because of religious beliefs or through fear of being punished by the authorities. On the third night, while coming back to Yangon, she was caught. The rest of the group (including her father, Political Prisoner 7/20) was arrested for criminal association, for having been found together with her. 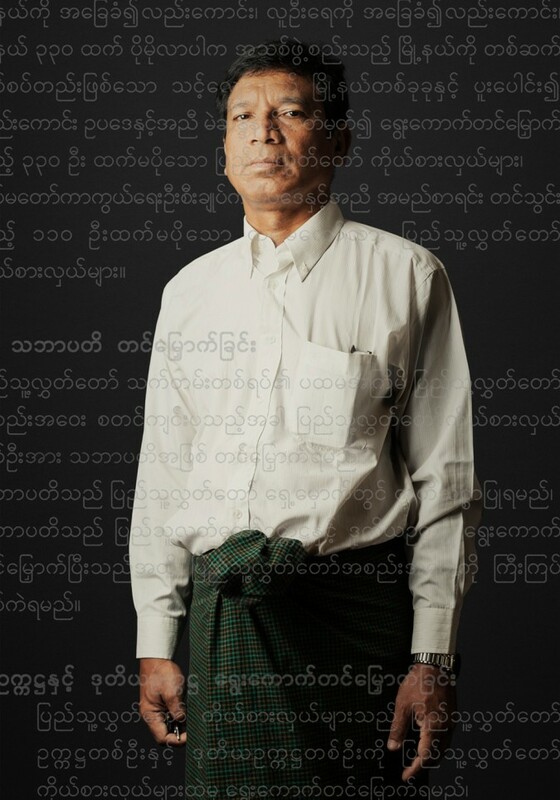 Arrested in 2007 for 4 years and 3 months for helping reforming and reorganizing the outlawed All Burma Federation of Students Union (ABFSU) and his role in leading the non-violent Saffron Revolution in 2007. The charges included disrupting the stability of the state and causing public alarm. Although he was sentenced to 15 years and 6 months, he was released in January 2012 under a presidential conditional amnesty. Both his father (Political Prisoner 6/20) and grandfather, a National League for Democracy (NLD) MP who died in prison on August 1988, were actively involved in the 1988 uprising. 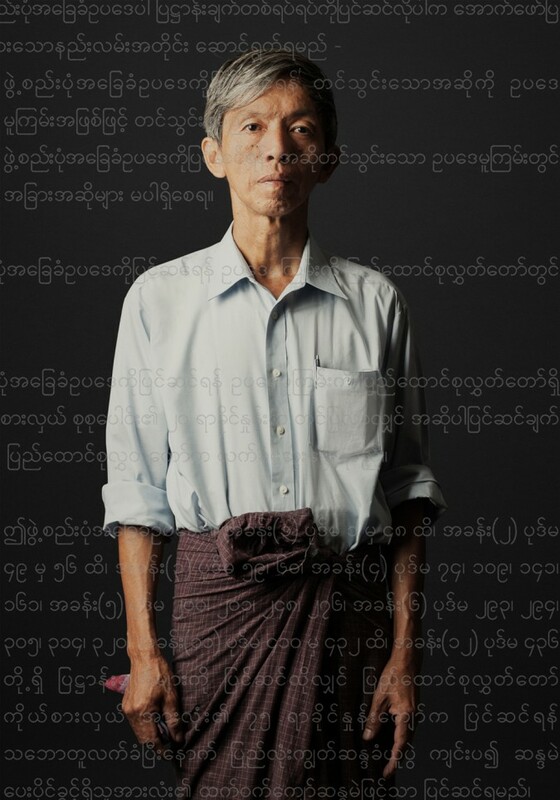 He was again arrested in 2013 for 20 days for demonstrating in Yangon. One of the leaders of the 88 Generation Students who were at the forefront of the 1988 pro-democracy uprising, he was arrested in 2007 for 4 years and 5 months for participating in the Saffron Revolution. He was sentenced under various charges, including a law calling for a prison term of up to 20 years for anyone who demonstrates, makes speeches or writes statements undermining government stability, and for having links to illegal groups and violating restrictions on foreign currency, video and electronic communications. Arrested in 1989 for 15 years and 4 months for being part of the Communist Party. Arrested in 2008 for 2 years and 7 months for crimes against state tranquillity and unlawful association. 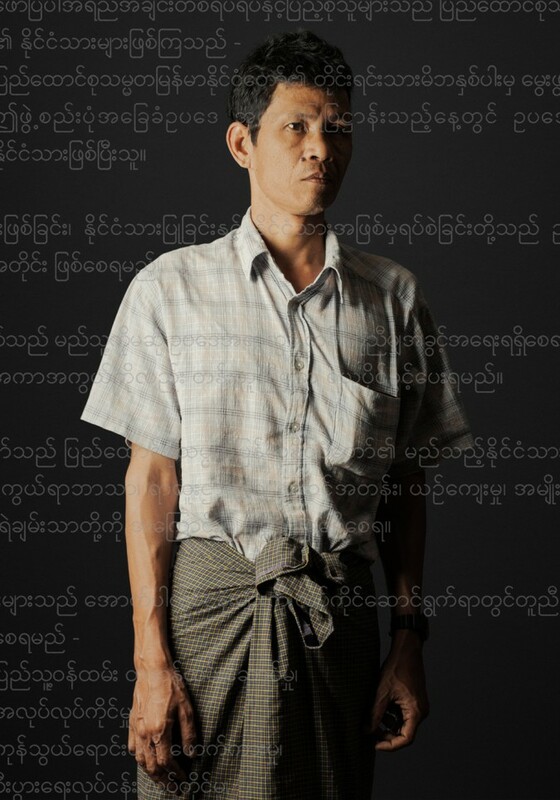 Both Nay Win and his daughter (Political Prisoner 4/20) were arrested in the aftermath of the May 2008 Cyclone Nargis disaster for helping to bury the people killed by the storm, despite the then-ruling military regime’s efforts to block aid to affected regions. On their third night coming back to Yangon they were caught and the 6 were arrested because Phyoe Phyoe Aung, Newin’s daughter, was there and she was “part of a political movement”. 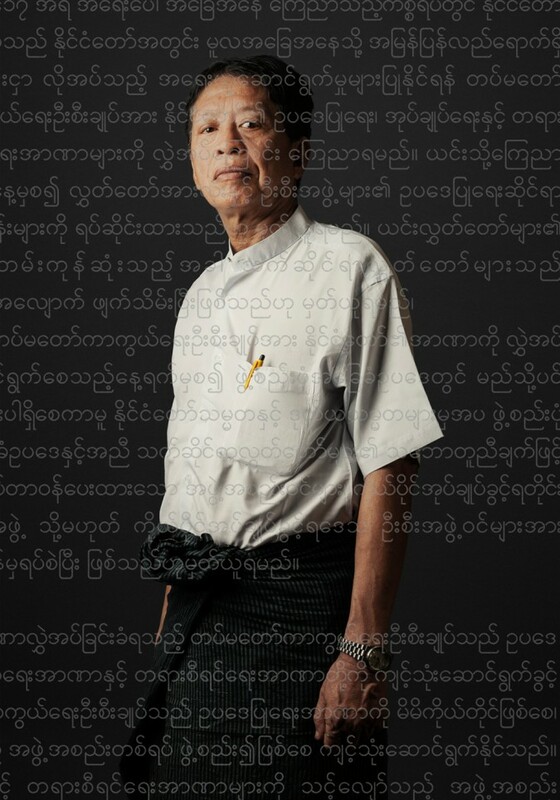 Arrested in 2000 for 9 years for his activities as a NLD member and for helping issuing the NLD member’s statement. The statement asked for the release of Daw Aung San Suu Kyi and other Central Executive Committee members who were under house arrest, for the Head Quarters and (Yangon) Division Branch to be allowed to reopen. It also called for urgent tripartite dialogue between the Government, NLD and Ethnic groups, and denounced the unlawful action of the State Peace and Development Council. They printed the statement on a computer and sent it to the Voice of America through the US Embassy. When in prison, his daughter died in a motorcycle accident in 1999 and both his wife and mother died in 2000. 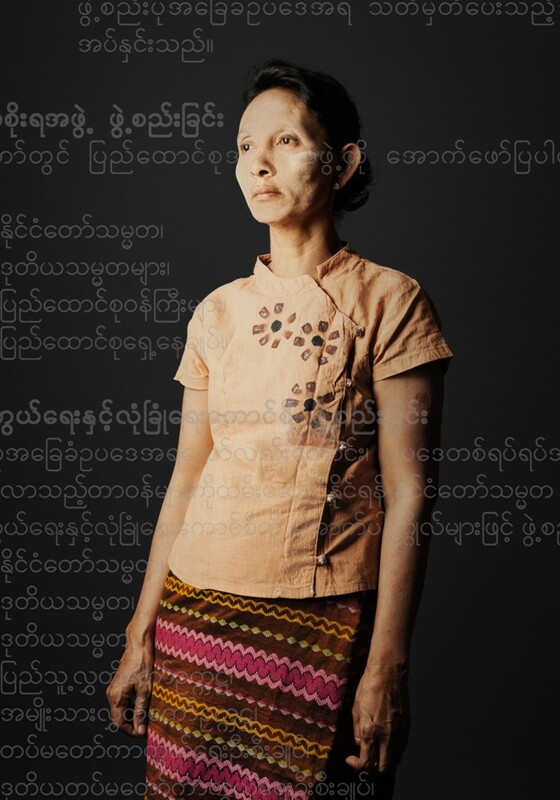 She was 23 when she was arrested in 1975 for nearly 4 years for participating in a demonstration at the Shwedagon pagoda in commemoration of the anniversary of the 1974 workers’ strike. She later participated in the 1988 Uprising and in 1990 she participated in the multi-party general election under the AFPFL Original Party. Since December 2011 she is a member of the NLD. She is the daughter of Ba Swe, Minister of Defence from 1952-1956, and Prime Minister between June 1956 and March 1957. 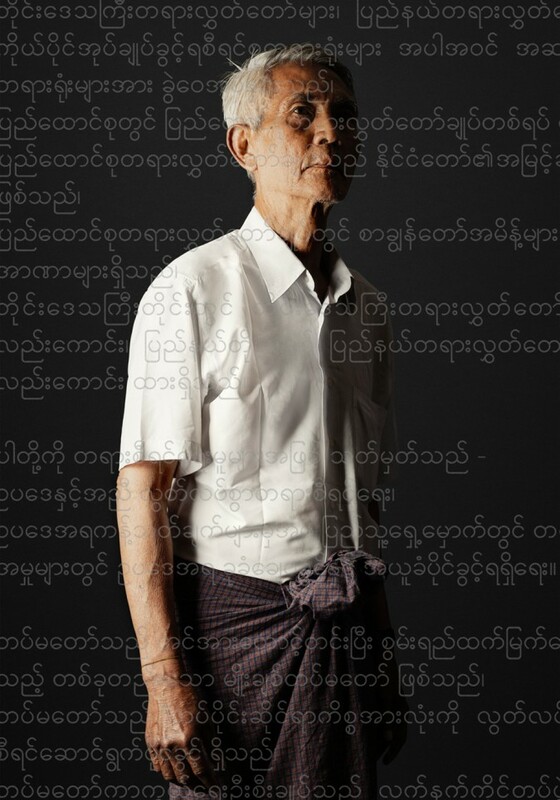 Arrested in 1974 for 4 years and 4 months for participating in the U Thant Crisis, a series of protests that took place in Myanmar in December 1974. The spontaneous protests were in response to the military government’s refusal to give U Thant, the third Secretary-General of the United Nations, a state funeral. The government declared martial law and violently crushed the protest. Arrested in 1974 for 4 years for participating in the U Thant Uprising in 1974, a protest against the government for not honouring this famous countryman with a state funeral. The students wanted to move U Thant’s body to the Yangon University to give him a respectful burial. Dhar (knife) Than Myint (aged 26) showed his knife to the police, and with other students snatched the corpse just before it was scheduled to leave for burial in an ordinary Yangon cemetery and took it to bury on the former grounds of the Yangon University Students Union (RUSU). The military stormed the campus on 11 December killing some of the students, recovered the coffin and buried U Thant at the foot of the Shwedagon pagoda. Arrested in 1997 for 6 years and 9 months for not having given away her husband to the authorities once he started on political issues. Arrested in 1995 for 8 years for the charges of ‘published law and Illegal organization’. In January 1993, Myanmar’s National Convention was first convened by the military to draft the country’s new constitution. On November 1995, Daw Aung San Suu Kyi issued a press statement that criticized the National Convention for being undemocratic in its composition and work procedures (only 15% of the 677 delegates had been actually elected). After this, all 86 of the NLD delegates briefly attended the Convention and then walked out. One of them was U Kyin Thein. They were officially expelled from the Convention for being absent without permission. Arrested in 1997 for 4 years and 5 months for sending a letter to the government against the confiscation of the lands of the farmers by the military government. He was 58. 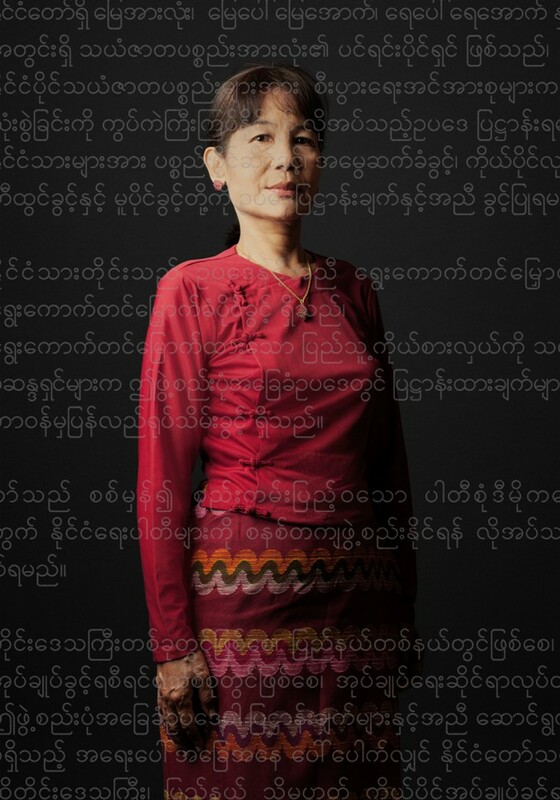 Arrested in 1991 for 7 years and 8 months for being a member of the All Burma Federation of Student Unions (ABFSU). He was falsely accused of having a gun. Arrested in 2007 for 3 years and 3 months for re-founding the outlawed ABFSU and his role in leading the Saffron Revolution in 2007. 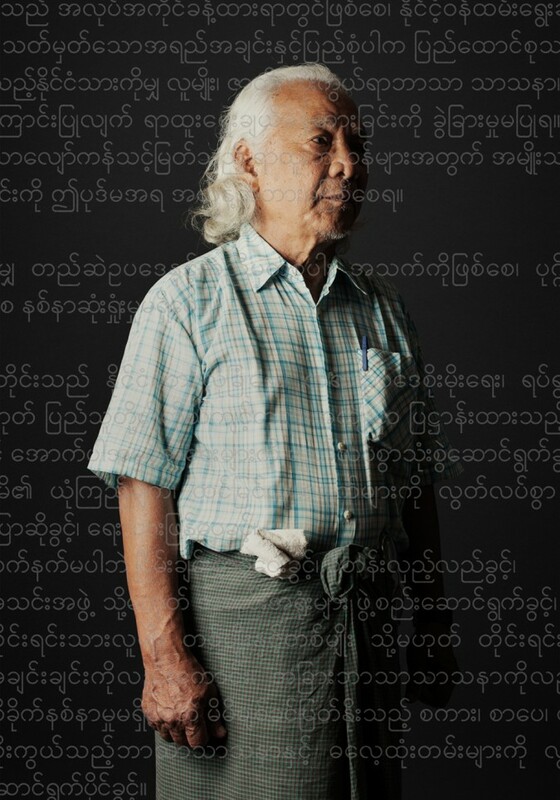 On September 2007 Sithu Maung participated in the demonstrations with peaceful monks and other protestors, demanding to be allowed to form student unions and called for democracy. Many were arrested by the military and police force. Sithu Maung said to the media “this movement may stop for a while, but already students, artists, monks and musicians have worked together. We will bow and pay respect to those who were killed for this movement. The revolution will continue.” Although he was sentenced to 11 years and 6 months for unlawful association and crimes against state tranquillity, he was released in January 2012 under a presidential conditional amnesty. Arrested in November 2007 for 4 years. 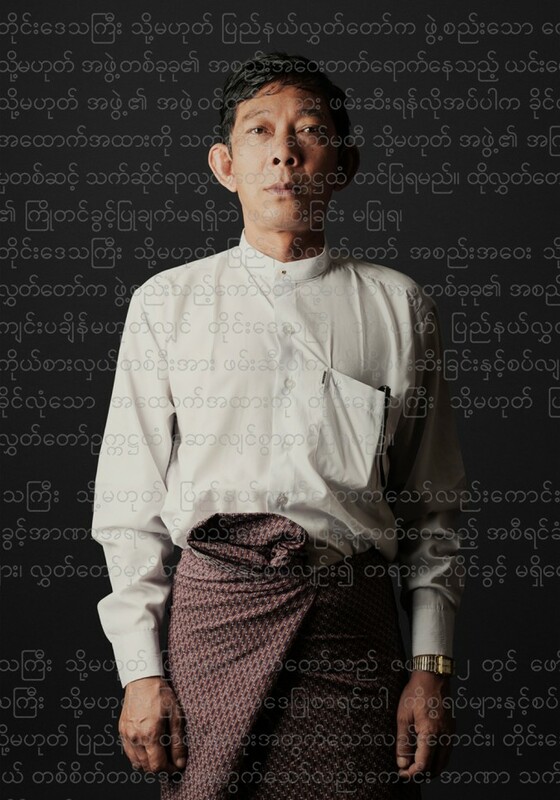 Both him and his wife Daw Nu Nu Swe were arrested at their home in Yangon, by security forces and local authorities after they failed to open a door quickly enough when intelligence officers tried to enter their home while searching for their son, Sithu Maung, Political Prisoner 16/20. They were sentenced to six years imprisonment with hard labour. In their defense, they testified in court that the police had knocked on their door late at night with no warrant and had not been accompanied by local officials and so they had not let them in at first because the did not know who they were. The couple, who were both in their 50’s, were found guilty of three charges, including harassing officers on duty and inciting a riot in their ward. Arrested in 2004 for 7 years and 7 months for being a member of the FTUM fighting for bigger salaries. The Federation of Trade Unions of Burma (FTUM) is an underground trade union in Burma. It was formed in 1991 and includes workers and students who were involved in the general strike of August and September 1988. Activities of the union are primarily restricted to information gathering and advocacy. Arrested in 1974 for 11 months for delivering anti-government pamphlets. He was 17 at the time. 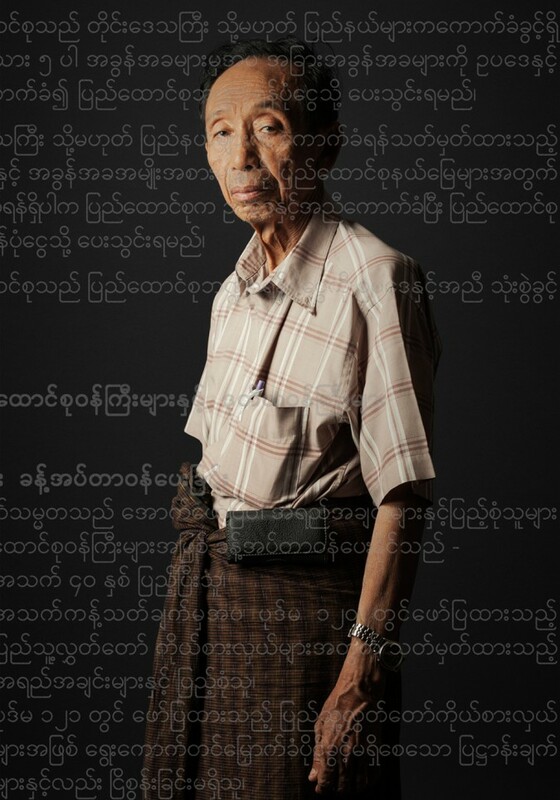 Later, in 1976 he was arrested for 1 year and 8 months for participating in the protests held to mark the centenary of the birth of Thakin Kodaw Hmaing, a famous writer who had promoted peace talks between the regime and armed resistance groups in 1963. Thousands of people participated. They did this during the curfew period. 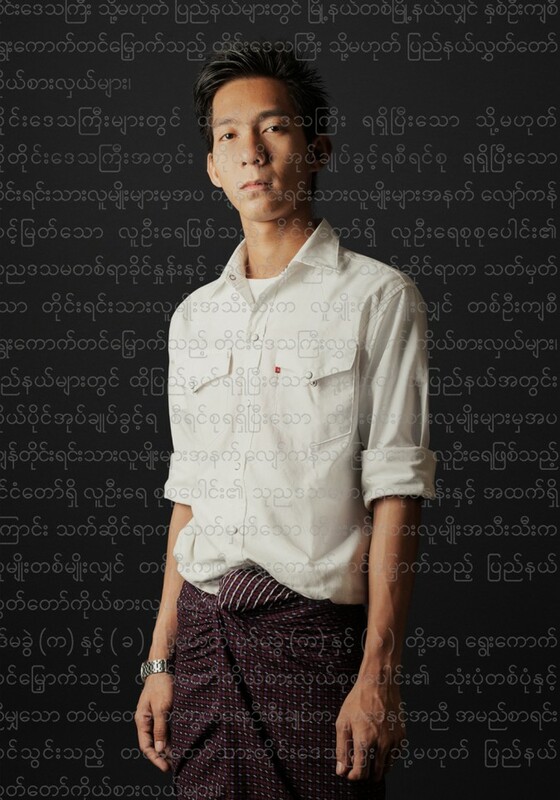 In prison, Ye Kyaw Swa went on hunger strike to protest against the restriction of the prisoners’ access to books. Arrested in 1974 for 6 years and 1 month. 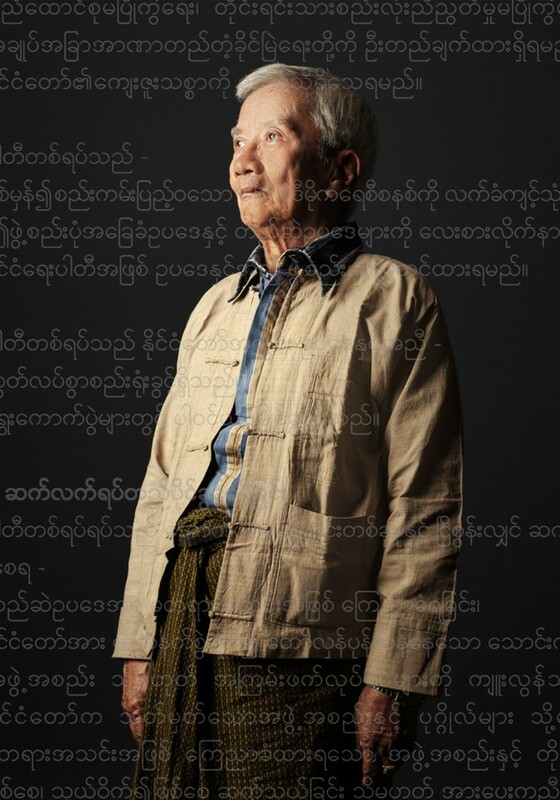 In 1974 the military government held the first people assembly according to the new constitution and the Burma Socialist Programme Party (BSPP). On March 25th 1974, policemen from the Kamaryaut Police Station (near the Yangon University compound) arrested some 3rd year students that came from the market by bus, falsely accusing them of pickpocketing. Tony Zaya was a 26-year-old student, and also in that bus. Later that day, in protest, Tony Zaya and more than 100 other students and also civilians burned this police station (they had made sure nobody was inside).